Tablets are hot! Sales of the Apple iPad, the Google Nexus 7, and others are quickly outpacing laptop sales as consumers begin to realize a full computer is overkill for most of the things done on the Internet. With their compact size, simple interface, long battery life, and relatively inexpensive pricing, tablets are making Internet use more accessible and convenient for a wider range of people. Unlike PC’s, there are not a lot of technical options that you have to deal with when purchasing a tablet. Basically you make sure the screen looks good, it’s responsive, and there is enough storage space for your needs and you’re all set. Tablets are mainly designed to be “viewers” to a content provider’s offerings, and to reach this content, you need an Internet connection. That’s where an important decision comes in: should you get a Wi-Fi only tablet, or spend more and get one with built in 3G/4G access? If you think about it, tablets aren’t used like smartphones. You don’t whip out your tablet to check your Facebook status while walking down the street. They’re used in places you have a chance to sit down and get comfortable, and it seems like most of those places have Wi-Fi available. I myself have owned a tablet for two years and haven’t once regretted saving the extra $200 for the built-in 3G/4G option. If you’re one of those people that does use your tablet while on the go, or if you tend to travel a lot, there is an alternative that will save a lot of money. a) Large cost savings when purchasing. b) Avoids often over-priced/contract locked data fees from the major carriers. c) Hotspots can supply Internet to any device, not just a single tablet. Since Mobile Hotspots are so compact, you can just keep it in your pocket or purse and turn it on if you happen to be in a place with no Wi-Fi available. Hotspot data plans tend to be a lot less expensive than going through carriers like AT&T or Verizon. Also keep in mind that you have the option of turning the service off if you know you’re not going to use it for a while. Some people only want the service while they travel in the summer, or if they live in two different locations and need Internet access at only one of them. You can simply deactivate the service, and then reactivate when you’re ready to use it again (a great advantage to not being stuck in a contract!). If you need to be able to connect your tablet in areas without Wi-Fi, definitely skip the 3G/4G option. In the same way a 20 oz. bottle of soda is often more expensive than a 2 liter bottle, you’re being charged a premium for the packaging. 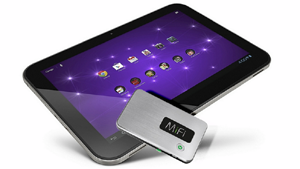 If you need to keep your tablet connected anywhere, using a Mobile Hotspot makes for a smarter purchase. Thanks for article on mobile hotspot vs. 3G/4G – I didn’t know costs or mechanics. As for your questions about tablets, the Samsung tablet you purchased is actually pretty decent. What problems were you having with it? Most problems I see with people checking email on a tablet are when they go to check mail- they try to log on to their mail through a webpage like they do on a computer, and that’s not practical. Tablets have Apps- small, specialized programs that do specific tasks. You would want to set your email account up in the built in Mail app to check your mail. Much easier! The iPad and the iPad Mini are popular (I own a Mini myself). They’re great tablets, and the only real difference is size: the iPad has a 10″ screen and the iPad Mini is just under 9″, so it’s basically a size preference. If you’re more comfortable with a computer, small Ultrabooks run in the same price range as the iPad and run Windows, so you may be more familiar with it. Next Next post: Google Mail Has a New Compose Window!